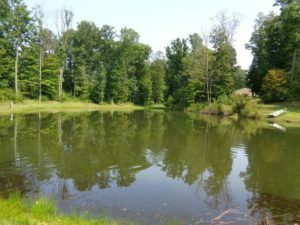 Triple Nickel Getaway is approximately halfway between Athens and Marietta along beautiful state route 555 in Washington County. This is a perfect place to relax for a few days and spend some time fishing in a private, stocked pond (catch and release) while enjoying the woods frequented by wildlife. It is suitable for couples, business travelers, families and anyone who wants to enjoy the beauty and history of southeastern Ohio. 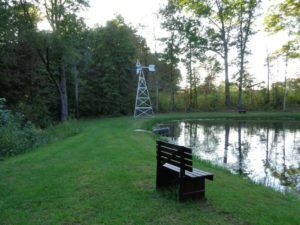 pond with a windmill, fire pit and benches to enjoy nature. The apartment has a patio with an electric grill. 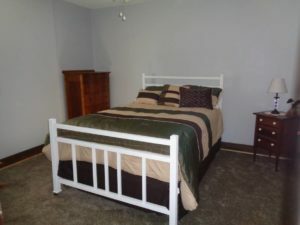 A furnished kitchen-refrigerator, gas stove, toaster, microwave, coffee maker, pots/pans are supplied. Bring bottled water as city water is not provided. Two outdoor fire pits with plenty of wood is available. TV/DVD player are furnished. Cell phone useage is enhanced with Web Booster. Self check-in is with keyless entry. 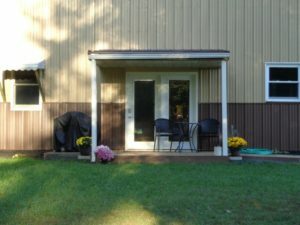 The apartment has no steps and is wheelchair accessible. Tax is included in my price.